Instead of a lot of introspection and navel gazing in its finale, Arrow (as has been its tradition) went more for wall-to-wall action under the threat of nuclear war. It was a good choice that hid some of the flaws that come about when trying to stop modern warfare and black magic. Darhk manages to launch the world’s nukes after stealing Felicity’s laptop. So with little time to spare, Team Arrow has to stop the nukes, stop Darhk and keep Star City from falling apart at the seams. In the end, it’s not a pretty process and it leaves just about everyone on the team broken in some way. With the exception of some spinoff-related diversions and gentlemanly time-outs, taking out Damien Darhk has been the goal of the season. The situation has never been more dire. Darhk is at the peak of his powers thanks to the nuking of a small town in Virginia and has a pack of HIVE machine gun toting goons that spring to attack with a flick of his wrist. Felicity is on the edge of stopping the nukes, when the goons crack the Arrowcave’s security (a sign on the door that says “NOT The Arrow’s Hideout”) and tear the place up. With everyone on the team demoralized by the development, Curtis comes out of his coma to give Oliver a pep talk about the kind of scrappy person it takes to live in Star City. It’s a similar message that Ollie uses to quell a riot and thanks to the miracle of television, rally his team. Felicity and Curtis hack their way into the missile bearing down Star City and divert it. The team splits up to stop the rest of the nukes and take out Darhk. In a troubling loophole to Darhk’s power, it appears that the fightin’ spirit of recently rioting Star Citians is enough to weaken Darhk’s magic and start a cool martial arts battle between he and Ollie, which later turns into a battle royal that Diggs, Lyla and Quentin join in on. In the end, Darhk dares Oliver to kill him, believing that since Ollie spared Slade Wilson’s life there’s no way Ollie will do the deed now. For Laurel and the thousands dead in the nuke blast, Ollie ends Darhk with an arrow stab to the heart. While there wasn’t a ton of character work done in this episode, what was there is significant to the future of the show. Team Arrow has been through the wringer this season and between the prospects of perishing in a nuclear blast and the opportunity to take a breath once the Darhk threat was eliminated, most of the team decides it needs some time. Diggle admits to Lyla to killing his brother in a less than honorable way (even though the treat to his family was still very real). He rejoins the service and appears to be going on an deployment as his way of rebuilding his honor. After her episodes of bloodlust, a dead boyfriends and threatening to kill a child, Thea decides it’s time to step away from the vigilante life and do some soul searching of her own in a well-appointed house. Quentin has been kicked off the police force, and he seems at peace with that. He decides to take Mama Smoak out of town for a while and regroup. Even Ollie goes through a major change. Thanks to his speech and his popularity in the last election, Oliver is appointed mayor of Star City and takes the oath. The only constant is Felicity, who declares her faithfulness to Team Arrow to the end. *Despite Laurel being mentioned – a lot – but not seen, it was interesting that Katie Cassidy was still listed as a cast regular in the opening credits. That doesn’t not happen with performers who are written out of the show. *Felicity’s GPS tracker was in “an abandoned office building downtown.” Given that the Palmer Tech Building is the only structure in Star City that appears to be occupied, you have to be a liiiitle more specific than that Felicity. *Star City was so lucky that it was targeted by the one Minuteman missile in the U.S. arsenal that isn’t a MIRV (meaning each missile contains multiple warheads). Come on Arrow writers, at least make the missile launch from Cuba or some fictional rogue nation in Central America if you aren’t going to do any research. *For those who always wanted to know exactly where Star City is located, the map showed it on the southern tip of Lake Michigan which means it’s either standing in for Chicago or more likely Gary, Ind. *Ollie, let’s talk archery safety for a second. I know you want to send a message to Darhk, but shooing an arrow with the purpose of grazing his cheek with a crowd of a couple hundred people behind him does not fall into the category of a good idea. *Back on the island, Ollie has to kill both the people under the sway of the idol. Argus and Amanda Waller show up to pack up all the magical gear and throw it in a dark hole in the ground. She offers Ollie two choices: Stay a hermit on the island or be an agent for her. He takes option C, fulfill his promise and go to Russia, where we can only hope better flashbacks await. *While we know that Felicity is steadfastly Team Arrow, there was no concrete indication she is back on Team Ollie. You could guess after all they’ve been through, Felicity could understand the reasons why Oliver kept secrets, but with this show it’s so hard to tell. *Is anybody going to get Darhk’s daughter who is still waiting in a hole in the ground for the end of the world to happen? 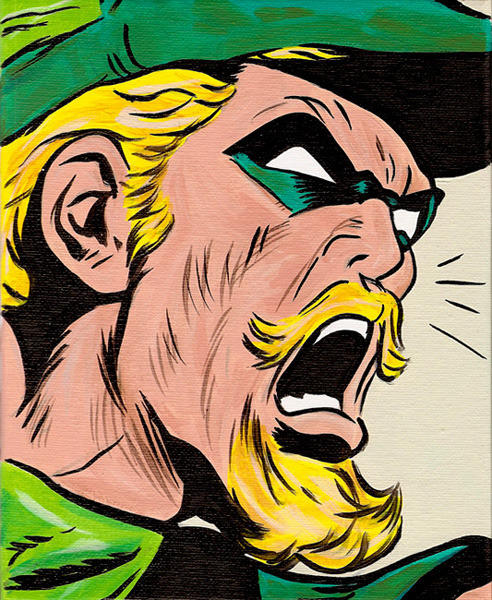 *It could have been the lighting but it sure looked like Ollie had the beginnings of the Van Dyke facial hair that is the signature look of the Green Arrow. Much like its CW stablemate, The Flash, it looks like big changes are in the works for the next season of Arrow. The breaking up of the team, no matter how temporary, at least felt organic given what everyone went through. As for the episode itself, it felt like Darhk got weak in a big damn hurry with not much explanation (and the HIVE goons forgot they were carrying guns), but things moved along at a good pace and the action was well put together. This finale might not have been memorable, but it at least accomplished what it set out to do. Next story Alien: Covenant Is Getting Very Confusing, But We’ll Still Watch It, Won’t We? Previous story Did a Showtime Executive and a Recent Screening Accidentally Spoil Homeland, Season 6?